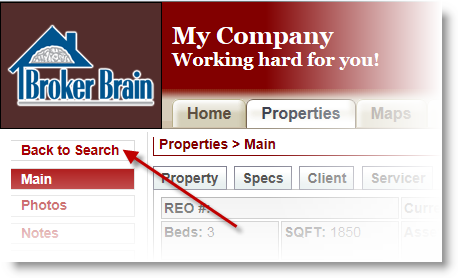 Using our search feature, you can easily locate any property within Broker Brain. 1. Click on the Properties Tab at the top of the screen. 2. Click the Search sub tab at left. You can enter information into one or more fields. 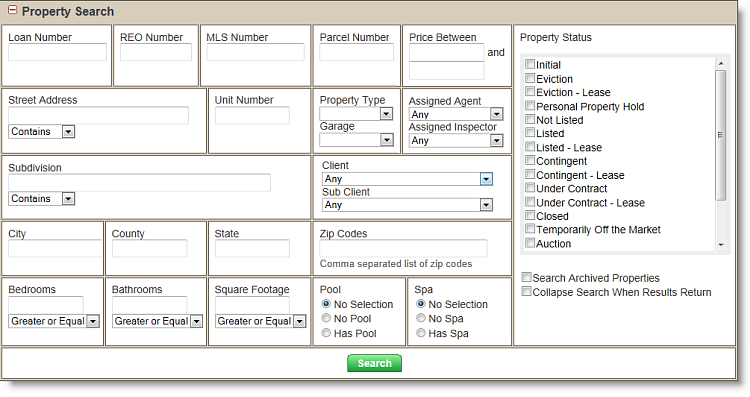 You can search for properties that contain, start with, end with, or match exactly any address information you type in. Most of the fields will allow you to type only a portion of the information, however the zip code field requires the entire zip code. To view more information about a property, click on the Click for more info line located at the bottom of the property information. This will expand the property to show more detail. To open a property for viewing or editing, you can either click on the property address or click the green Edit button located beneath the property photo. Broker Brain will open the property on the Main tab. To return to the Search Results, click the Back to Search button located at the top of the property menu, as shown in the screen shot below. For information on how to make editing changes to existing properties, click here. You can also elect to include the Asset Type in the search by following the instructions detailed here (look for Viewing Asset Types for Multiple Property Statuses at the bottom of the page).